With Kiddom’s beautiful, actionable reports, it’s never been easier to analyze performance and pivot instruction. Reports help monitor student progress over time, track growth by mastery level, and analyze both class and student performance on individual standards. This first reporting metric depicts overall mastery. This is the class (or student) average on all graded assignments. This also illustrates class and student mastery over time, allowing you to reflect and intervene in real-time. Depending on overall mastery, this graph will be a certain color: Developing is red, Approaching is orange, Mastery is light blue, and Exceeding is dark blue. The next graph tracks student mastery groups. The pie-chart depicts the overall landscape of your class. 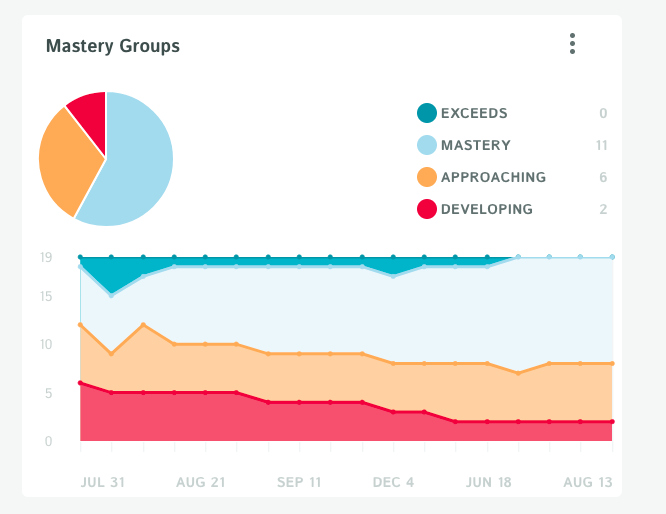 Below, you can track how student mastery groups change over time. Click the points to see student names. These analytics may be useful for grouping or setting up peer mentoring opportunities. Every standard assessed is tracked, providing you with the detail you need to determine which concepts or standards require remediation and which have been mastered. Hover your mouse on the standard pills to read a full description of the concept/skill. A dotted line simply means you have only assessed this specific standard once. Align this standard to more assignments in order to make it a solid line. Click on the standard pill from your reports page to get a more detailed summary of how your class is doing with a standard. Easily sort the order of students by first name, last name, or performance. Use the arrows next to the standards card to move between standards. Personalized learning doesn’t happen magically. Teachers must effectively use student achievement data to adjust instruction in real-time. With these reports, that’s now possible. Kiddom gives you the ability to download PDF standards-based reports or assignment reports. Additionally, you can download standards-based or assignment data. The data reports are CSV files. When you have "Everyone" selected, PDF reports are sent to your email. You can download individual student reports by selecting a student from the drop down menu on the left. Note: If you have a collaborator in your class, they will be able to view your reports. Kiddom Academy users get all of these reports as well as additional insights. To learn more, click here!